Why a wood fired or biomass gasification boiler? Versatility– Distribution can be through liquid (radiant in floor/hydronic) or through existing forced air ductwork. Storage– Thermal storage allows the right amount of heat to be distributed to the house, during, and long after the fire burns out. Comfort – By incorporating large thermal storage, the heat is more even and controllable. Environment – Burning local, properly managed or waste wood in a clean, efficient boiler is an excellent alternative to gas or oil in terms of CO2 emissions, embodied energy and total impact. And, its renewable. 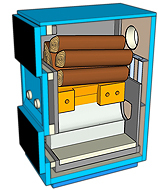 Operating Cost– The cost of heating with wood can be as little as 10% of the cost of heating with gas or electricity. If you manage your own wood lot, even less. Independence– Being uncoupled from the supply and volatility of fossil fuel prices and grid electricity for heating makes many of us a little more comfortable. Want Clean & Affordable Wood Heat?